When it comes to building community – it’s hard to pretend that facebook, especially facebook groups aren’t the king of the jungle. There are different ways to execute a meaningful and powerful facebook group. Some are set up entirely to sell services, others to simply bring people together – and if you are really smart, very particular and especially patient – you can actually accomplish both without annoying your audience, so long as you add value, set the rules of engagement, and demonstrate a level of expertise. Either way – so long as you stay true to your founding mission, and ensure you are building a genuine community (however you choose to define it), you can create remarkable value for both yourself and others. Building facebook groups isn’t always a technical skill. Some are sort of happy accidents, like “London Startups“, started by Benjamin Southworth who’s group has almost 40,000 members ranging from, as Ben calls it, ‘the curious to the committed’. 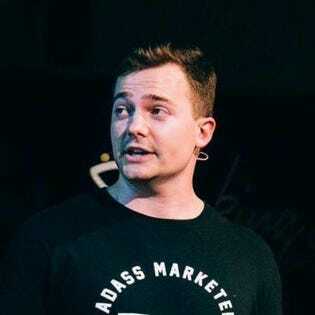 However – for every community that feels like a happy accident – there are 100s in their place that are designed meticulously to serve a purpose, and to grow very carefully and intentionally, just like “BAMF – Badass Marketing and Founders” created by Josh Fechter. For Josh, building an engaging community, like everything, needs a story. BAMF is testament to this concept – if not slightly ‘meta’. After a short career in growth marketing in the Silicon Valley, he decided to quit, and teach himself how to become the best copywriter he could be. It occurred to him that growth, and meaningful engagement online, could come from the power of words, the order of those words, and how those sentences were put together, probably even more convincingly than any growth ‘bot’ could manage. He was building software for fellow copywriters at the time, but realised that there was a distinct gap in the market for the technical skill of copywriting. After attending a number of events in the West Coast he arrived at the conclusion that whilst many were well set up to deliver strategic marketing tips – there definitely weren’t enough that told you how to do it let alone bringing people together this way – and so ‘BAMF’ was formed. It’s audience? You guessed it – ‘Badass’ Marketing (experts) and Founders’. For Josh, starting BAMF in a purposeful way, as he puts it ‘To empower 1 million founders’ to be better technical marketers with the tools and information they need to at the very least get their first 10,000 customers, has proven to be a mission people have got behind. To demonstrate the point, Josh often uses his own technical skill (from writing thousands of posts), to write engaging copy that is highly clickable, encourages endless comments, keeps the reader engaged until the end of the post and subtly sells in some sort of value – in this case, the fact that BAMF itself is an agency that those busy founders who might have a product to build, and employees to galvanise simply don’t have time to do themselves, and so BAMF can do it for them. However – whilst Josh sets the rules within BAMF about who can post, and who can’t (in order to keep the quality high and especially engaged, he is judge, jury and executioner of ‘quality’), he often encourages fellow marketers to tell their stories, share their tactics and go deep on a technical level about the latest software, hack, or growth opportunity they’ve discovered. And because of these rules, the content itself, is magic – and so too, is the organic growth through word of mouth within the group. With almost 24,000 members – BAMF isn’t one of the larger facebook marketing groups necessarily, but it is entirely focused on clear technical quality – and all of it’s members are vetted to ensure a high bar of contribution and engagement. All of this, of course, is an art, that one doesn’t simply learn overnight. Josh has taken years of testing, in true growth marketing fashion, to get it to this level – and he has published free E-Books giving away all his strategies for building communities just like BAMF, and writing engaging copy just like he does – making the whole thing entirely meta but inexcusable for a marketer looking to build a facebook community not to know about. The Copywriting Bible demonstrates how to write the copy, and THE BAMF BIBLE was the top voted book on Product Hunt of all time – so Josh’s real trick is to hook people in with real, genuine value, demonstrating what makes your group unique, that no one else can – and once you’ve demonstrated this – you can sell whatever service you want, and people will say nothing but thank you. In the meantime, some Facebook groups simply aren’t set up to sell anything, just to bring people together, and London Startups which as Ben points out ‘does exactly what it says on the tin’ has now grown at such a pace that the initial team are having to interview moderators to figure out how to stop the whole beautiful thing they’ve created from turning into a mess! Fortunately for Ben, he’s got thousands of engaged members that have received so much value from one another over the years that it’s become arguably the best known startup ecosystem in London – and as such, he’s hardly short of qualified volunteers to manage this next chapter of growth. What’s clear about these two Facebook Group experts approaches is that there are clearly 2 strategies you can deploy. The first is one of meticulous control, execution, and immense, consistent value creation by the owner. If you are going to hold the control to that degree – then the only way to ensure your members trust you to deliver that kind of value back to them, is to simply not let them down and be consistent, always turning up, and always delivering value – it’s no part time job. The second is one of filling a market gap or need, opening it up for wider growth and engagement and encouraging anyone to post anything – whilst this will always create more noise, it will also lead to far less quality by it’s very nature – and in a world of consumers turning off their notifications from social media to avoid distractions – this could be a problem moving forward. However Ben has amassed over 10 moderators to make sure that there’s never anything offensive – after all, whether you intend it to or not, your community can become your brand, and as such, your legacy – so it’s of utmost importance to keep it clean and stay in control, one way or another. However you decide to build yours, below are some tips to guide you. Use your knowledge of greater technical expertise to aid in the growth of your member’s businesses. Foster your connections and look for people who could benefit from knowing one another. Do something that’s meaningful to you. The medium doesn’t matter, as long as people are making meaningful connections. Set the rules and then let your group decide how to interact.